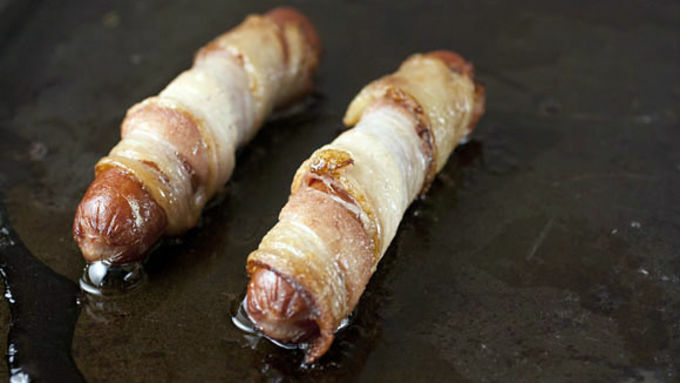 Take each hot dog and wrap it in a strip of thick bacon. Lay the wrapped hot dogs on a baking sheet. Bake the hot dogs at 350°F for 15-20 minutes until the bacon is very crispy. Toast your hot dog buns and prepare your onions, lettuce, and any other toppings you want. Add butter to a large nonstick skillet over medium heat. Once butter is simmering and hot, crack in four eggs. Cook eggs for 2 minutes on the first side until the whites are mostly cooked. 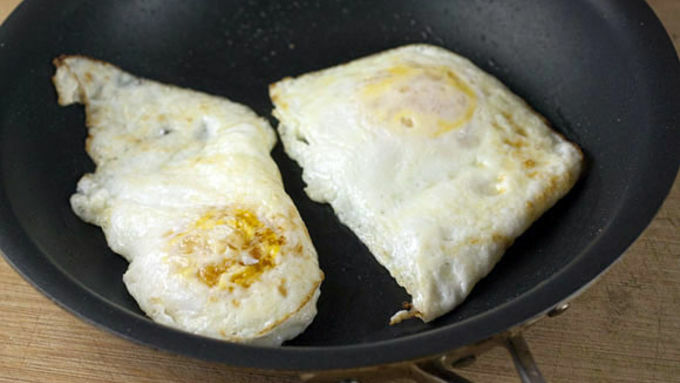 Carefully flip eggs to and cook for just 15 seconds on the second side. Remove eggs from heat. 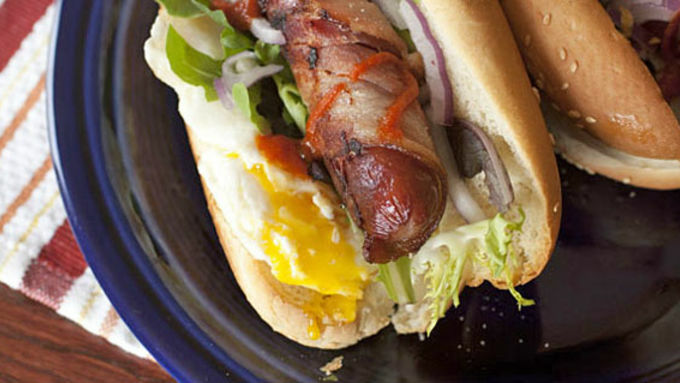 Add an egg to each hot dog bun along with a bacon wrapped hot dog. 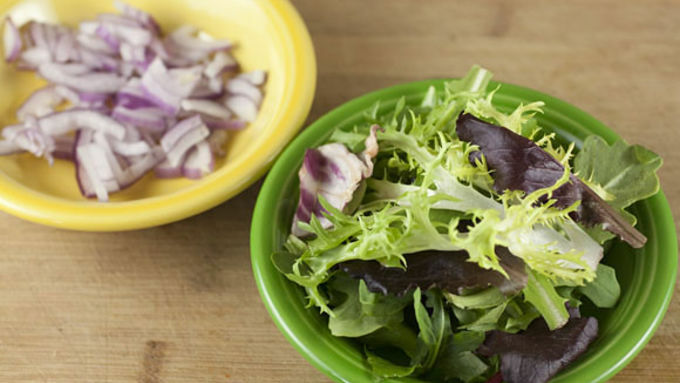 Top with lettuce and red onions and a drizzle of hot sauce. Serve immediately! 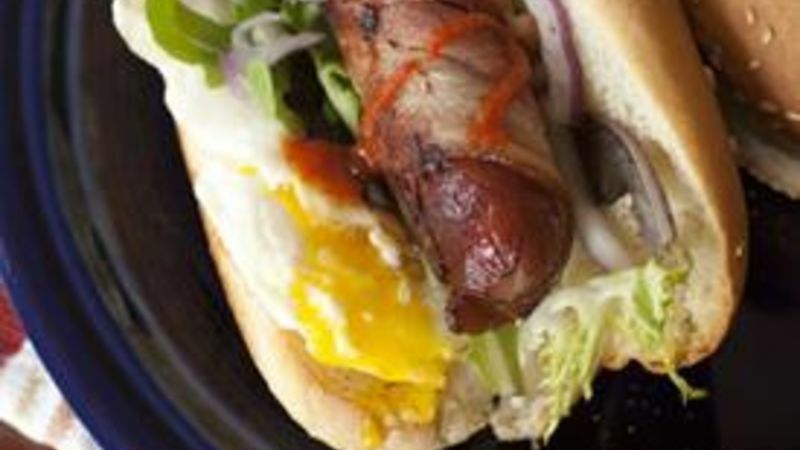 When is it completely acceptable to have a hot dog for breakfast? I’ll tell you when. Any time you plan on doing nothing but drinking beer and/or watching sports all day long. In other words, when tailgating. We are deep in the heart of March Madness right now, generally seen as one of the best times of the year for sports lovers. It’s important that you eat a hearty breakfast to soak up some of those beers and also give you lots of energy to deal with the heartbreaking buzzer beater that will shred your brackets. The breakfast hot dog is the breakfast of champions...watchers. There’s not a lot to this dog – which is good because you have sports to watch, after all. The key is taking each hot dog and carefully wrapping it in a strip of thick cut bacon. There are a ton of topping options for these guys, but I would keep it simple if I were you. I just cut up some red onions and lettuce and had some mustard, ketchup, and hot sauce at the ready for people who wanted it. You can let people make their own, just like a normal dog. I recommend piling on a few toppings and giving it a good drizzle of hot sauce. When the egg breaks and the yolk runs all over the place, it’s messy. But it’s also delicious. So fry up a few of these, crack open some beers, and get ready for some March Madness!